Co-designing and sharing tools for the future between Mexico & UK. 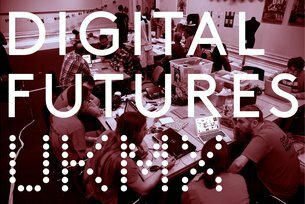 Digital Futures UKMX is a series of exchanges and prototyping labs connecting civic-minded citizens in Mexico and the UK around theme of civic awareness, engagement, collaboration and innovation. We would like people to come together and explore how we can work collaboratively, share ideas, influence and change the civic design of our communities, cities, public space and the web. These events are open to the public, everyone is welcome! UKMX2015 is the Dual Year of UK and Mexico 2015; a year-long celebration of cultural, educational and business exchange between our two nations. Digital Futures UKMX is linked with the V&A Digital Futures and Digital Design Weekend programmes. One of the British hosts for this exchange will be Dundee, the UK's only UNESCO designated city of design and also the future home of V&A Museum of Design Dundee. Over the 19th and 20th June, communities in Mexico City and Dundee will come together to explore, develop and co-design open collaborative tools and projects addressing issues such as the environment, climate, open data, waste, sustainability. Participants will have a chance to explore both cities in innovative ways and collaborate across the Atlantic. The workshops and events in Mexico City and Dundee will be linked via the web. What is happening at each city? 20 June: Makers, Music and Bio Research-Design for the Future and closing party. With Astrovandalistas, Interspecifics, MusicMakers Hacklab and FORMAT collective. Laboratorio Arte Alameda. 19 & 20 June: Small Society Lab cultural probes sharing, prototyping, food and music. VRC Dundee Contemporary Arts (led by Dundee Contemporary Arts, the University of Dundee and Creative Dundee). Digital Futures UKMX is an initiative proposed by the V&A Digital Programmes and the British Council, developed and made possible by the support of our fantastic partners Laboratorio para la Ciudad, Centro de Cultura Digital, Laboratorio Arte Alameda, DCA, University of Dundee, Creative Dundee and Uniform. Grace Quintanilla, founder and director of Centro de Cultura Digital, tells us how her creative hub is engaging a diverse range of communities in Mexico City.